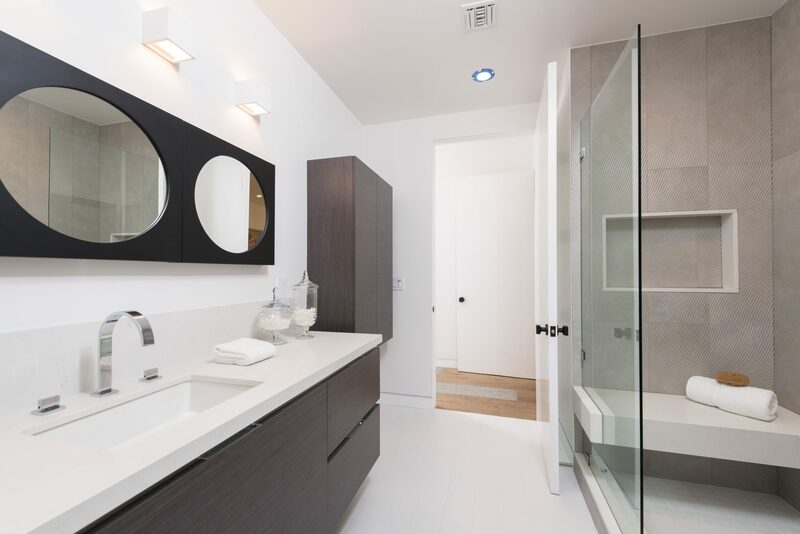 We Specialize in bathroom remodeling in Woodland Hills and surrounding areas. Full service re-modeler providing complete remodels, upgrades, plumbing and repairs, we do it all! 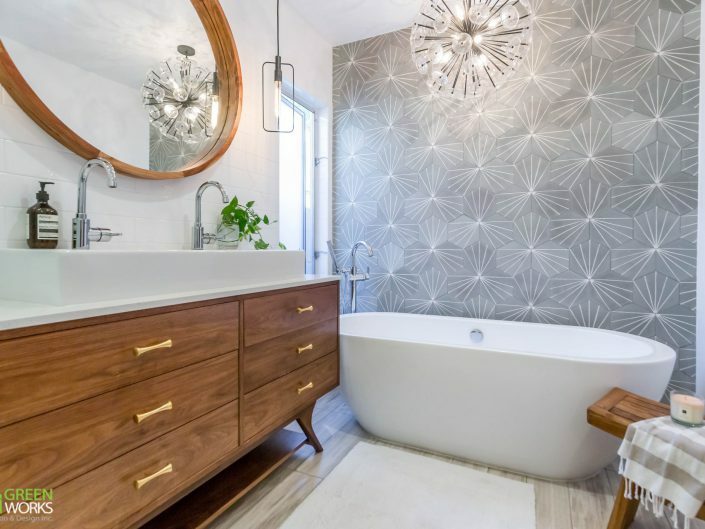 A CUSTOM BATHROOM can easily become your own private oasis. A personal spa with all the amenities, or maybe a luxurious guest restroom filled with tranquility. You should never have to compromise when it comes to comfort and for good reason. When done right your bathroom will be a place you go to unwind and free yourself from the many stresses your day may bring. Remove outdated fixtures and treat yourself to that Jacuzzi tub you’ve always wanted. Call today for the bathroom makeover of your dreams. Greenworks Construction and Design Inc. specializes in handicap-able bathroom renovations which require a highly advanced leveling technique to ensure stability. Q. BATHROOM REMODELING: WHERE TO START? We can not stress enough the importance of hiring a licensed professional. Countless times have we been called upon to redo the work of “contractors” who left homeowners with leaking roofs, cracked foundation and plenty more remodeling blunders. Aside from the obvious dip into you wallet these things can drastically shorten the life expectancy of any renovations you have done to your property. Hiring a licensed contractor will ensure the work is being done according to your city specific building codes. 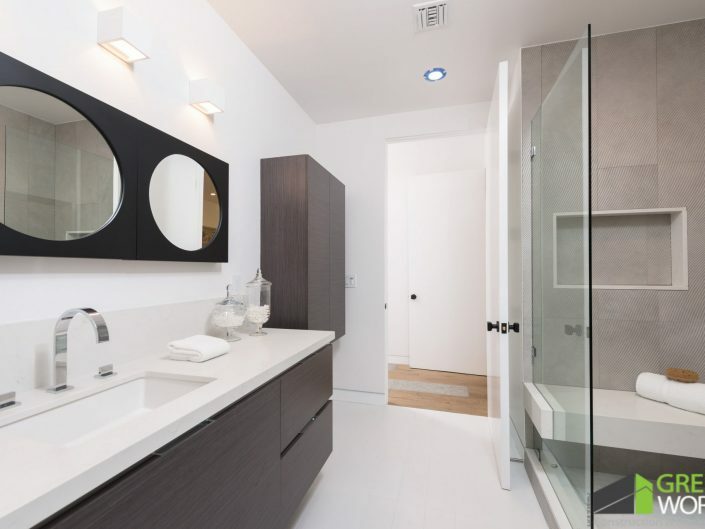 Regardless of the type of bathroom remodel you are considering to undertake it is best to consult with an expert bathroom remodeler in Los angeles. Q. HOW MUCH DOES A BATHROOM REMODEL COST? Every remodel differs from the next. Prices vary depending on a few major things. Structural changes can guarantee a fluctuation in cost due to archictectural plans and plan check fees from the city. Wall removals can be costly at times if any electrical or plumbing needs to be redone. The biggest expenses in a bathroom remodel come from the countertop & cabinets. Ofcurse each offer a wide range of materials to choose from that can either drastically increase or decrease your budget. Tile and flooring can become big ticket items depending on your style choices. In the end what it comes down to is choice of materials and scope of work. A partial remodel can run anywhere from 5-10k where as a complete bathroom remodel can be anywhere from 12k and up. Typically a bathroom remodel can take anywhere from 12-21 days depending on how extensive the work is. Keep in mind that half this time is hours spent off site cutting measurements for counter materials fabricating cabinets etc. we are able to beat the going average of our competition and complete a bathroom remodel in 12 days because we use all in-house contractors so you will never need to deal with third party delays. Structural changes can sometimes double this time because it involves getting plans approved by the city , plan check submissions, corrections and proper permitting. If your layout remains the same than we can guarantee a new bathroom in 12 days. Partial vs Complete: a complete bathroom gut-out will always mean a longer timeline where a partial remodel consisting of maybe just cabinet refacing , flooring and tile can be done within two weeks.